We’ve been experimenting with different keto dough recipes, trying to find one we really like. This was a variation on the fathead dough, using melted cheeses and almond flour. I tried the recipe here, but made a couple changes to it. I kept the Parmesan cheese but used mozzarella instead of pepper jack. I also made it in a different order, but after making other fathead doughs, I don’t think that made a difference with this particular recipe. As far as fathead doughs are concerned, this one was good. I liked the flavor the Parmesan cheese gave the dough. I think the recipe had too much coconut flour in it – but that is because I really don’t like the coconut flavor in savory dishes. (I think the coconut flour blends beautifully with chocolate). It had a really nice texture because of the coconut though. Next time I make it I will probably try it with all almond flour, and adjust from there if needed. It was a nice crust you could pick up with your bare hands though – that was really nice. 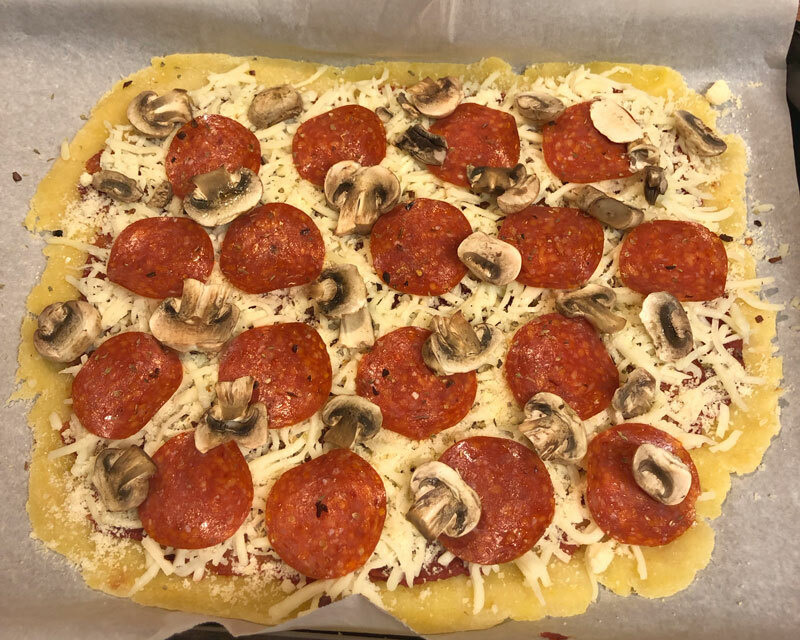 I topped it with tomato paste, mozzarella cheese, pepperoni, and mushrooms. Since the sauce was plain tomato paste, I sprinkled on a little onion powder, oregano, and hot pepper flakes as well. It was pretty good. We’re making progress. I took a small break from dieting after my surgery, and did a pretty good job maintaining. 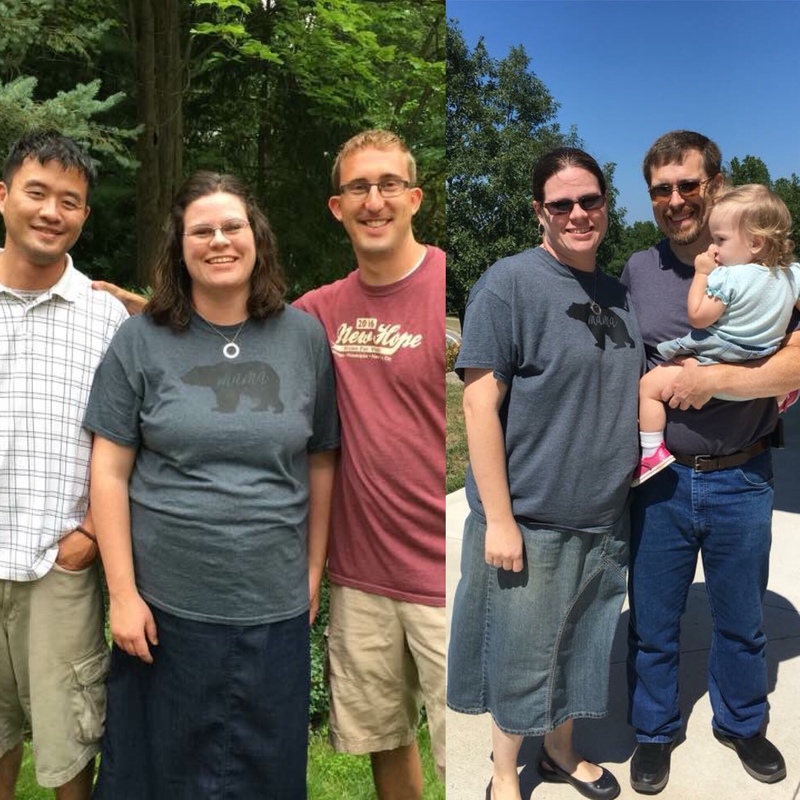 At the beginning of this month I decided to go back stricter keto again. Since then I’ve lost 3 pounds, which is encouraging. But what’s more exciting is the non-scale victories. My tight skirt that I avoided wearing is now comfortable, and even falls down if I place my phone in the back pocket. A friend told me last week that I had “lost a TON of weight!” – I can’t remember the last time I saw her though. The leggings I bought in December and hated are now looser and therefore almost comfortable. I thought I bought the correct size, but because I carry my weight around my middle, the waistband was tighter than I like. They’re still not loose enough for me to love them yet, but I can wear them now without hating them. That’s great for the super cold days in the shop now! And another victory that IS scale relate……I hit the 35 pound mark yesterday! I was very excited to see that in MyFitnessPal. 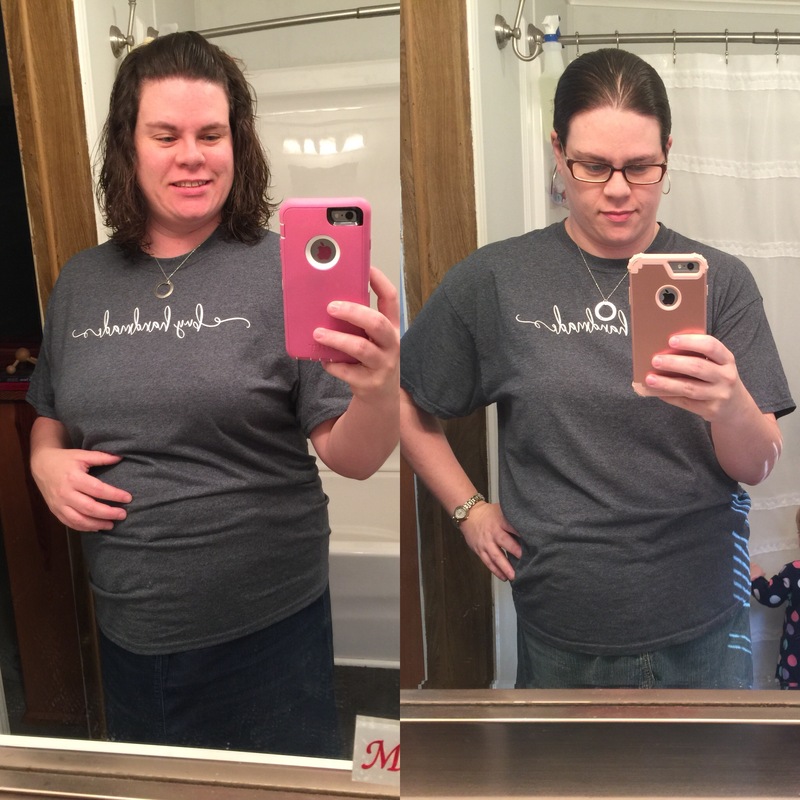 I’ve actually lost 41 pounds since Joy was born, but really didn’t start losing weight until last April. I also hit my first number goal. At this point my next number goal is down another 20 pounds, with my official “on the record goal” at 35 more pounds, and my personal final goal at 45 more pounds. The last goal may not be realistic because I don’t know how low my body will go now that I’ve had kids. We’ll see. This has me very excited and motivated to keep going! 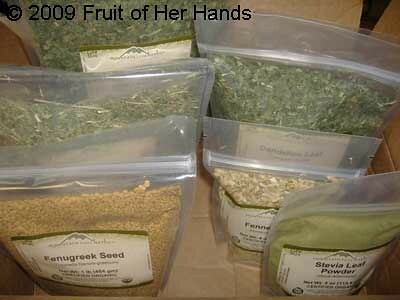 Today my order from Mountain Rose Herbs arrived. It was so fun to look through the box at everything. My original intent for the order was to get supplies to make Nursing Mother Tea. I had a good bit of supply issues when nursing Caleb, so this time, I’m going in armed and ready. Last time, I bought premade teabags by the case, and drank almost a gallon of the tea a day. It helped my supply – but I went through the tea SO quickly! 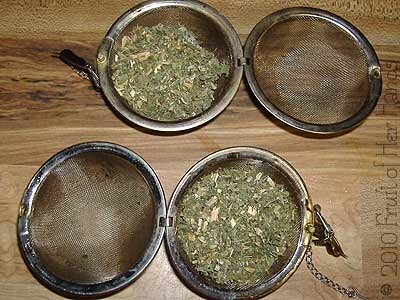 When I found a recipe to make your own tea using bulk herbs, I was thrilled. It helps that I should be able to get roughly double the amount of tea for about the same amount of money. Then while I was over at the Mountain Rose Herbs site, I ordered a few other things I’ve been wanting to try, like powdered stevia and soap nuts. I haven’t mixed up the tea yet, and I really can’t wait to try the stevia and the soap nuts! After my last visit checkup, I was really concerned with my weight gain. Granted, I hadn’t been overly careful with my eating, but didn’t realize just how much it was truly affecting me. My weight gain had been fine the first part of the pregnancy, but at my last visit I found out I’d gained too much that month. The only changes I really made this past two weeks were to limit my sweets and cut back on the carbs. The way I’ve been eating isn’t quite as restrictive as when I first started trying to go low carb, but it’s still been a challenge. The hard thing for me is adhering to specific carb counts for each meal. What I do like is the later meals of the day have enough carbs in them to allow more freedom than I expected. My next checkup was this morning. When the nurse weighed me, I found that I’d lost 4 pounds in the two weeks since the last visit. Don’t get me wrong – I wasn’t trying to lose weight at all. I was actually hoping for no more than a 2-pound gain (one pound a week). 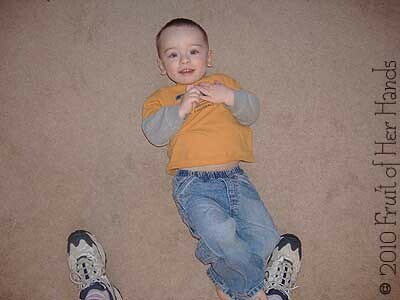 Maintaining would have surprised me – so a loss, especially here in the third trimester, was quite the shock. Since the only changes I made were healthy ones, I’m not worried about it. It does make me curious how my next appointment will go though. I wasn’t trying to eat a lot of junk food, but I certainly wasn’t being as careful as I should’ve been. Hopefully this time my weight gain will be more manageable. What really amazes me is just how much seemingly little changes can make such a difference.